The 2014 VIZZI Award Winners are on exhibit at the Berkeley Art Works, 116 North Queen Street in Martinsburg. The work is on display May 8-18. Gallery hours Thursday 12-5, Friday, 12-8, Saturday, 12-5, and Sunday 12-3. There will be a reception on Saturday, May 10 from 4-6pm at the gallery. Please join us to encourage and support these fine young artists. The Vizzi Awards is presented by James Rumsey Technical Institute, Blue Ridge Community and Technical College, WV EDGE & the Regional Printing Institute. 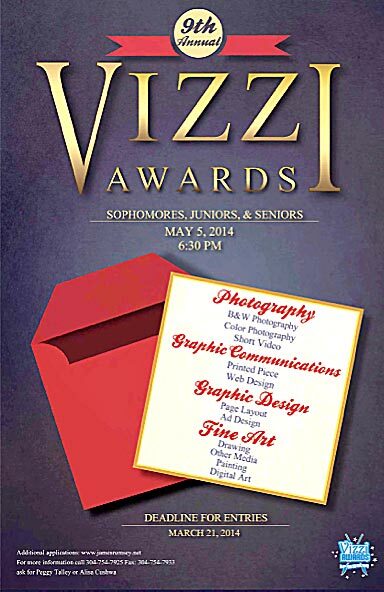 The mission of the VIZZI Awards is to create a BUZZ about student achievement in visual arts. The Vizzi consists of three categories covering eleven different contests. Students who are 10th – 12th graders and live in Berkeley, Jefferson or Morgan counties are eligible to enter.